Home→Awards→SONGS OF MY SELFIE Preorder Bundle–Ends March 31st–Sign Up Today! SONGS OF MY SELFIE Preorder Bundle–Ends March 31st–Sign Up Today! 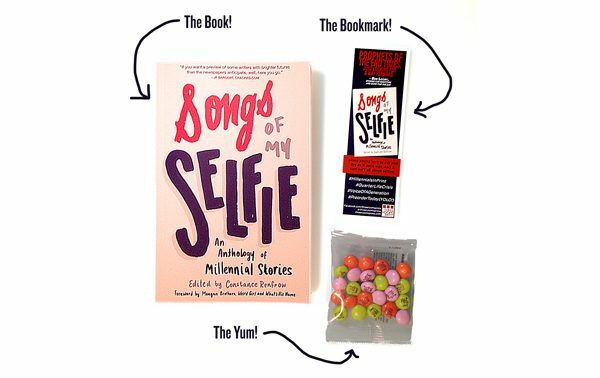 The Millennial Book of the Year–SONGS OF MY SELFIE: An Anthology of Millennial Stories–is almost ready to hit the shelves! Why settle for just plain old copy of the book when you can PREORDER and get cool SWAG along with it? SONGS OF MY SELFIE editor Constance Renfrow hand crafted this special bookmark, which features the names of all authors, plus urgent hashtags to call attention to the work of young writers. What would a preorder package be without a little sugar to urge you to press the button? We special-ordered one-of-a-kind M&Ms with the SONGS OF MY SELFIE hand written lettering (courtesy of cover and typography designer extraordinaire Victoria Bellavia). She’s the real deal, and so are these yummy collectible candies. Colorful? You bet–Pink, Lime Green, Bengal Orange. Just by preordering the SONGS OF MY SELFIE advance package, you’ll be entered to win a pair of FREE tickets to the NYC SONGS OF MY SELFIE Official Booklaunch, Friday, April 8, at the historic Greenwich Village venue Cornelia Street Cafe. Already preordered your copy on Amazon or Barnes & Noble? You can still get in on the special preorder bundle! Just email a screenshot of your order confirmation and your mailing address to quarter-life-crisis-submission@threeroomspress.com and we’ll send you the bookmark, M&Ms, and will enter you into our drawing. All preorders must be placed no later than March 31, 2016. Unfortunately, this offer is only valid in the US. SECRET MENU: Once you get your book, take a selfie with Songs of My Selfie, post it to Instagram, Twitter, Tumblr, or Facebook, and then send us the link. We’ll send you an extra packet of SOMS M&Ms plus an official, personalized Songs of My Selfie Street Team Member Card that you can use for future special offers.